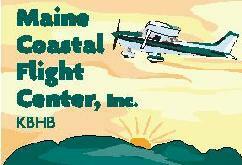 Maine Coastal Flight Center conducts seasonal Sightseeing Flights from the Hancock County-Bar Harbor Airport, offering outstanding views of Mount Desert Island including the town of Bar Harbor, many lighthouses, Cadillac Mountain and Somes Sound, along with the other various mountains and harbors. It is truly the ‘Best Way to See the Island’. We also offer a year round Flight School out of the Bar Harbor Airport giving Flight Instruction, Ground Instruction and Private Pilot Ground Schools.